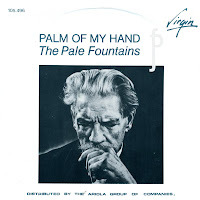 After the success of 'Thank you', I can imagine that the Pale Fountains would have expected more success with the follow-up single 'Palm of my hand', released in 1983. It is a short, but effective song. However, the single was ignored by the record-buying public although it did get some radio exposure. I didn't know this track at all but since I liked the other two singles by the band already featured on this blog, I decided to take the gamble. And once again, it paid off. When I found 'Thank you' after a couple of years searching, I also found this single, 'Unless'. I decided to give it a try - and I wasn't disappointed. It's the same kind of elegant pop music that they made on 'Thank you'. 'Unless' was released in January 1984 and didn't reach the charts - much like all their other singles. 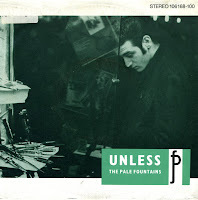 The Pale Fountains split up soon after this release, leaving Mick Head to form Shack and Andy Diagram to join James. Bassist Chris McCaffery died in 1986 of a brain tumour. Michael Head, Chris McCaffery, Thomas Whelan and former Dislocation Dance trumpeter Andy Diagram formed The Pale Fountains in Liverpool in 1980. They released their debut album 'Pacific street' in 1984. Their sole UK singles chart top 50 single was 'Thank you', released two years before that. It reached number 48. 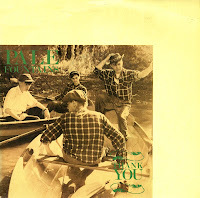 I heard 'Thank you' on a compilation album a few years later and quite liked the track. When I finally found the single in 1993, I was very happy to finally own it.